We possess advance facilities for fabrication and high production set ups to construct the retention cages. We provide cost effective range of retention cages to cater variety of industries. These retention cages are made from high grade wire-mesh. These retention cages are used for different kind of pallets. They are widely used in warehouses. They are ideally serves the purpose to arrange the products on pallets and prevent them from falling out. They are exclusively used to arrange the products systematically. 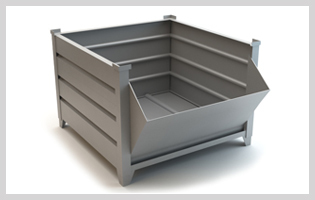 It is the ideal solution for the storage and transportation of difficult objects. Our range of wire mesh retention cages contains high tensile strength. It is also available with high corrosive property. We are able to provide customize solutions for different specifications.